Kosher 101: What are the Kosher Groups? Kosher groups are a way of classifying different types of kosher ingredients. A Group 1 ingredient does not require a kosher certificate or kosher symbol. A Group 2 ingredient requires a kosher certificate, but no kosher symbol printed on the package. A Group 3 ingredient requires a kosher certificate and a kosher symbol printed on the package. A Group 4 ingredient is bulk packaged and only approved from a specific source. A Group 5 ingredient is bulk packaged and only approved from a specific source when accompanied by a special letter. Group 6 and 7 ingredients are not approved for use in kosher products, and Group 7 ingredients are not allowed in a kosher certified facility. Cybros the Sprouted Bakehouse, a leading producer of fresh sprouted grain breads, today announced that it will use only non-­genetically modified grains, natural sunflower oil, and locally sourced domestic honey in all of its bread products. The company also announced it is changing its name to Angelic Bakehouse to better reflect the wholesome goodness of its breads. Owners Jenny and James Marino said the ingredient upgrades and name change are part of a series of moves that position the family-­owned company for continued growth and potential national distribution opportunities, while maintaining the product purity and quality customers have come to expect. The changes mean that Angelic Bakehouse will add more premium ingredients to its unique and growing product line made primarily from unprocessed sprouted whole grains, instead of traditional flour. Additionally, to limit allergens in its products, the company will discontinue cookies and other non-­sprouted grain products that contain soy or treenuts. Executive Vice President James Marino said Angelic Bakehouse also recently attained the OK-Pas Yisroel Kosher Certification, one of the world’s most respected symbols of kosher approval. He said the national kosher certification will allow the company, which currently distributes its breads to grocery and specialty stores across the Midwest and in markets in both the Northeast and Southeast parts of the country, to explore expanded national distribution opportunities. To match its new opportunities, the company is finalizing plans to select a Southeast Wisconsin location for a new, 22,000-­square-­foot facility that it will occupy by the end of the year. Jenny Marino said the new facility will offer the company the opportunity to increase production, expand product lines and pursue additional channels. “Cybros was the foundation for our success, and Angelic is our future,” she said. About Angelic Bakehouse Angelic Bakehouse is the only company in the central and eastern United States that uses freshly ground sprouted grains, whole grains in their purest form, to create natural, sprouted grain products that truly taste great – no cardboard aftertaste that consumers often find with healthier, good-­for-­you fare. Pure ingredients. Pure products. Pure quality. That’s what you can expect from Angelic Bakehouse. To find out more, or for Angelic Bakehouse retailers near you, visit www.AngelicBakehouse.com. Terressentia, maker of unique, locally produced flavored alcoholic beverages, recently entered into a kosher certification agreement with OK Kosher Certification. 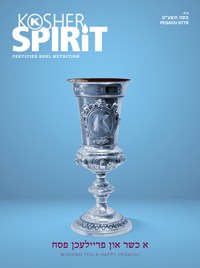 The newly kosher certified products, under the brand name Local Choice, include Vodka, Strawberry Kiwi Flavored Vodka, Espresso Flavored Vodka, Fiery Pepper Flavored Vodka, Tequila, Titillating Pepper Tequila, Luscious Lime Tequila, Bourbon Whiskey, Black Cherry Flavored Bourbon Whiskey, Rum, Spiced Pixie Rum, Gin, and Mango Vodka Rum Mix. Local Choice spirits have received top industry awards, including World Spirits Competition Bronze Award, SIPS Platinum Award, Best in Class Aged Products, Best Flavored Vodka Gold Medal, and many others. In addition to high quality, locally sourced ingredients and environmentally conscious production, kosher consumers can now rely on the superior kosher supervision of OK Kosher. The OK Kosher symbol, which is universally recognized as the highest caliber of kosher supervision and certifies some of the largest companies in the world, lends yet another layer of oversight to Local Choice products. The OK currently certifies over 500,000 kosher products. 55% of consumers who buy kosher products choose kosher products because they believe kosher to be a mark of health and safety and high quality control. Consumers can be assured that Local Choice spirits will enhance their social events while adhering to the highest level of kosher supervision. For more information, please visit http://new.localchoice.us and www.ok.org.